Today's card is one I did for a new friend who did something really special for me on July 4th. I wanted to combine the holiday colors and my Thank You sentiment. 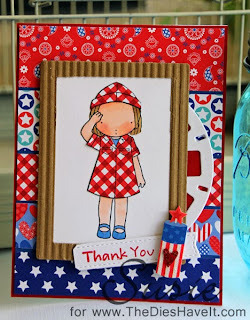 The stamp is called Pure Innocence Soldier Girl and is from My Favorite Things Stamps. The frame is actually their Instaframe die that I cut into a longer frame. The little white reel is their Reel die. I sorta went crazy with the MFT stamps and dies today! Even the banner is a die from MFT Stamps! My papers and that cute little fire cracker are all from Doodlebug. I love the brightness of this paper line. That's about it for today. But I'll be right back here tomorrow with a brand new project for you. Such a cute and bright card. Love it.